With a stay at Elea apartments in Chania, you'll be within a 15-minute drive of Chania Lighthouse and Venetian Port. Featured amenities include dry cleaning/laundry services, multilingual staff, and luggage storage. Free self parking is available onsite. When you stay at Chrisanthi Apartments in Gouves, you'll be near the beach and within a 5-minute drive of Dinosauria Park. Featured amenities include a 24-hour front desk and luggage storage. 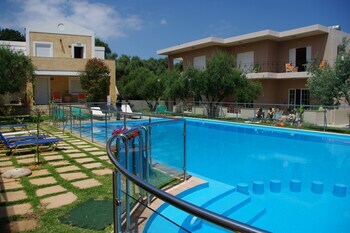 With a stay at Emily in Samos, you'll be within a 5-minute walk of Port of Samos and Samos Port. Featured amenities include a 24-hour business center, a 24-hour front desk, and multilingual staff.